There’s far more to choosing the right dining table than meets the eye. The table style- traditional, contemporary, Arts & Crafts, mid-century and other styles- will, of course, depend your home’s décor. However, the table’s size and shape can only be determined after careful consideration of several factors. Read on and learn how to choose a dining table that’s tailored to your dining room’s size and fully meets your needs. Dining Room Size // The size of your dining room and other furniture in it will guide you in selecting the maximum size of your table. To do this, measure the distance between walls (or the front edge of other furniture placed along walls) and deduct 84”. This is the maximum size table the room can accommodate. Why? Because you must allow about 42” of space between all edges of the table and wall (or furniture front edge) so diners can pull out their chair and be seated. It also allows others to walk behind a seated diner. This rule applies to most all table shapes. More on that subject in a minute. Dining Table Size. 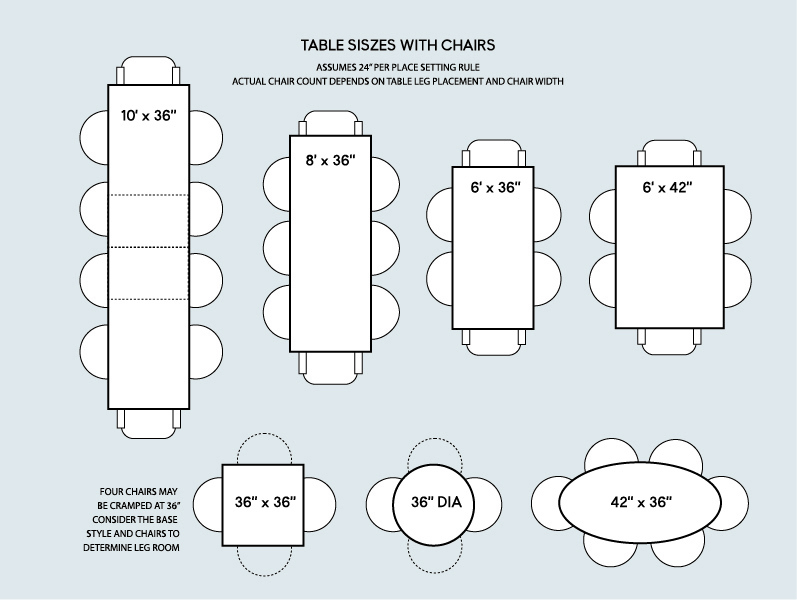 Now that you know your table’s maximum size, determine how many people can be seated. Each place requires about 24” of space. This width size allows room for a dinner plate and flatware. It’s also the right space for most dining chairs and elbow-room. So, in theory a six-foot long table could accommodate up to three people on each side and one at each end, total of eight. The “theory,” however, depends on the position of the table legs. 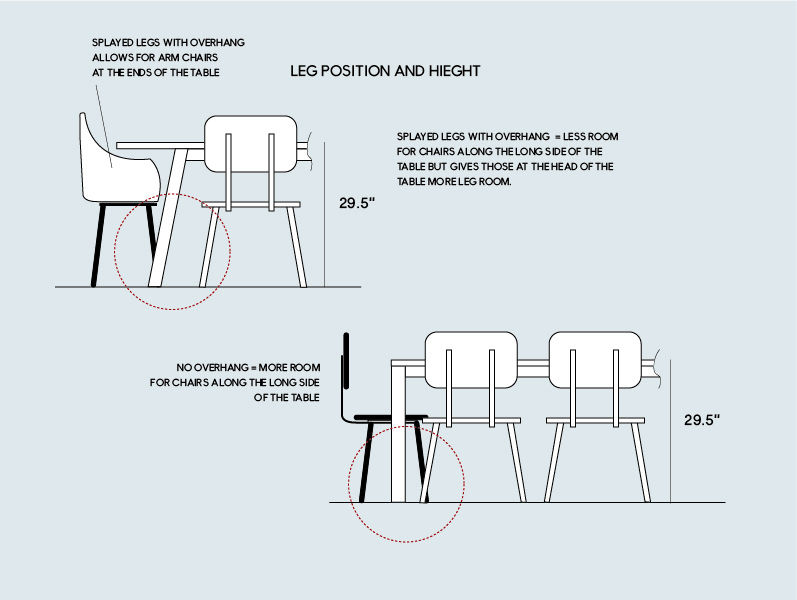 Table Leg Position // A well-designed table avoids the dreaded leg straddle. Think about it. If the legs are positioned close to table corners, the theory holds. Bring those legs in to far and you lose two place settings, one on each side. Dining Table Width // How wide should a table be? You’ll need 36” to 42”. At these widths, space is allowed for dinner plates and glassware plus room for serving plates, wine bottles, candles, etc., in the middle. Table Height // Most all dining tables are 29” to 30” high. This works well because dining chair seats are 17” to 18” off the ground. And there’s another critical element in the table/chair relationship. That’s the width of the table apron or stretcher. These are the horizontal pieces that connect at the top of table legs and form the table’s base. Table aprons should not exceed four inches in width. Any wider and crucial space for comfortable leg room below the apron is encroached . 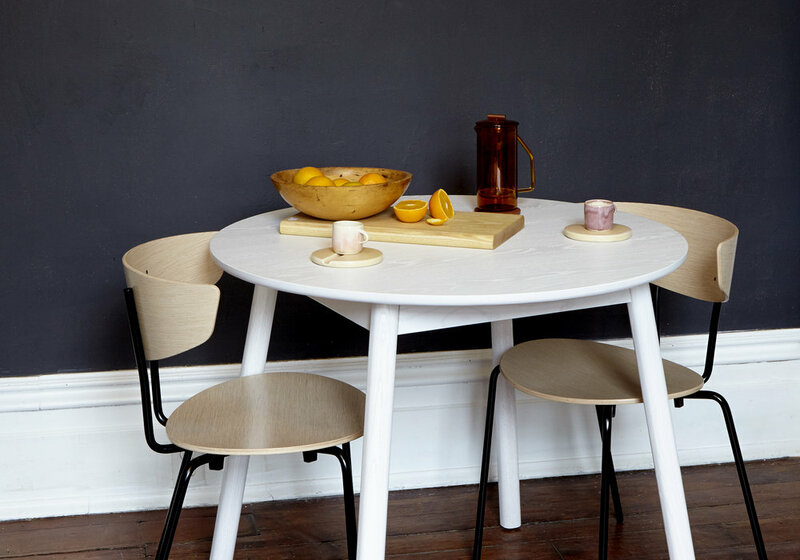 Table Shape // The most common dining table shape is rectangular and that’s no accident. Most dining rooms are rectangular so the shape compliments the room. A properly sized rectangular table will most accommodate the most diners. Square tables and round tables are effective in smaller spaces but usually offer a limited number of seats, usually four to six. On the plus side these smaller tables provide a more intimate seating arrangement because everyone has a direct view of everyone else. Round tables with legs seat fewer people than round tables supported by a pedestal. The space between legs limits the number of place settings. Lastly, don’t be fooled into thinking you can use the 24” per place rule at a round table since the 24” narrows quickly resulting in cramped legroom. Sharing a meal is one of the most important social events we do as humans. The experience is optimized when your table is designed for comfort and convenience. Use our guide and you’ll make the right choice and enjoy your table for years to come! Shop our dining tables here. Custom lengths and widths are available by request. Steve has been a woodworker for more than 35 years. During his career he was Editor and Publisher of Popular Woodworking Magazine for 20 years. He has authored dozens of articles on all aspects of woodworking and cabinetmaking and edited hundreds of others. Behind the scenes video of the BF team on set shooting the first bff collection.